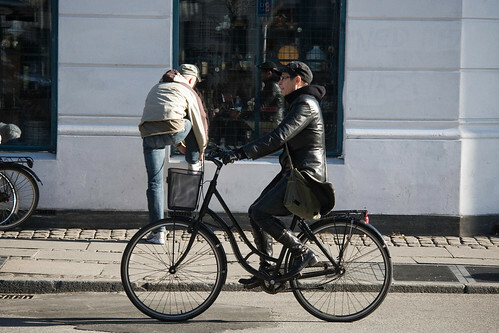 Leather jacket, gloves and boots on Istedgade in the Vesterbro neighbourhood. Cowboy boot retro with skirt. When you read this I'll be heading off to Vienna for some Cycle Chic business and then on to Brno, Czech Republic to speak at a conference about Marketing Bicycle Culture. Hoping for some great cycle chic shots from both cities. Stay tuned. I've discovered this blog today and have to say it is really amazing and inspiring! Only one thing however... Flipped through so many pages but could NOT see even ONE picture of a cyclist with a helmet.. Do you imply that cycle-helmets are uncool/unstylish? This question pops up with every five comments. 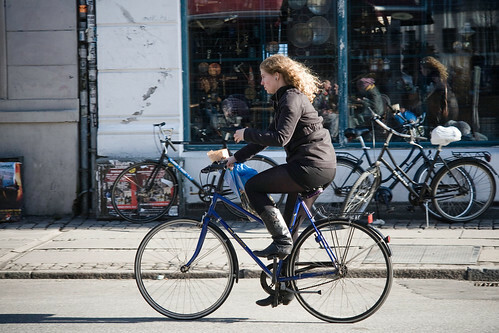 Most people in Copenhagen don't wear helmets. Maybe it's because they're uncool and unstylish. Maybe it's because they're rather silly and don't work? The boots are looking good ! I am excited to see what lovely pictures you bring back! You never show any pedestrian helmets EITHER! Is that because the idea is just stupid, or because you have a thing against pedestrians. In your first photo, the pedestrian is doing a very dangerous thing, lifting his foot up to a window opening so he can retie his shoe, surely he should use protection? Hmm. I think that lady is really on a hurry. she's too serious in driving. Is that a man on a woman's bicycle? I've always thought it kind of weird that there are bikes for each gender; I would think men needed the lower bar more than women, if you know what I mean.